Setting up your AcctVantage Mobile server couldn't be easier! The computer that you already use to run AcctVantage ERP Server is also your Mobile server. And, the server will launch automatically when you start up AcctVantage! There is no particular need for complex IT configurations or hoops to jump through, simply launch and go! The AcctVantage Mobile Server launches automatically whenever AcctVantage ERP Server is launched. You do not need to take any additional steps to 'turn on' the AV Mobile Server. For normal operation, it is not necessary to launch the AV Serer Status window unless you need to stop/restart the service. 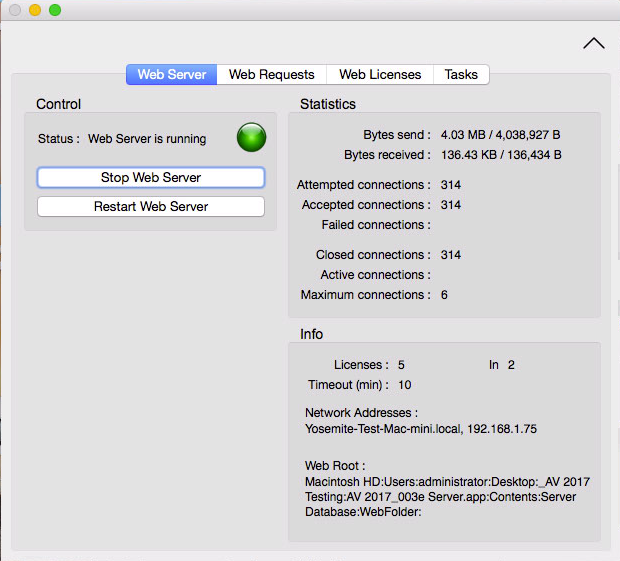 For AcctVantage 2018 and earlier, the Server Status window opens automatically on the AcctVantage Server computer and is used from that hardware. For AV 2019 and later, the Server Status window is accessed via any AcctVantage Client from the Administration > AV Server Status menu item. The mobile server is still running on your AV Server hardward; it's only the status monitor window that moves to AV Client. For AV 2019 or later, access the AV Mobile Server Status monitor from any AcctVantage Client via Administration > AV Server Status. For AV 2018 or earlier, the Status monitor is found on the AcctVantage ERP server hardware. The IP address of your server is shown and will be used by the mobile devices, browsers, scanners, etc. to connect to the server. We suggest that you assign a permanent IP address to your server. In the example below we are using an address (192.168.1.75) that is only valid on our local network, however, you may assign a public IP address for users outside of your home office. When connecting to AV Mobile, use port 3301 for SSL traffic and 3302 for unencrypted connections. There are two ways to utilize SSL connections for AcctVantage Mobile, a self-signed certificate or one issued by a 3rd party. Remember to always use port 3301 for SSL connections! AcctVantage Mobile can use self-signed certificate for SSL encryption. This means that your data is encrypted as it passes over the web, but the security certificate has not been issued by a 3rd party provider. Using a self-signed certificate allows us to deliver an encrypted environment out-of-the-box without significant IT overhead. Teh drawback is that your users will be warned that the certificate is invalid or otherwise untrusted. For a truly secure connection, you will want to use an SSL certificate issued by one of several 3rd party providers. Once you obtain your certificate and matching key, you will need to place them in the same directory as your AcctVantage data file (.4DD file). In the image below you see the green text in the URL indicating that a trusted, 3rd party issued, certificate is in use. Coincidentally you are also seeing that we've mapped our AV Mobile server to a subdomain. Your local IT pro can help with that! 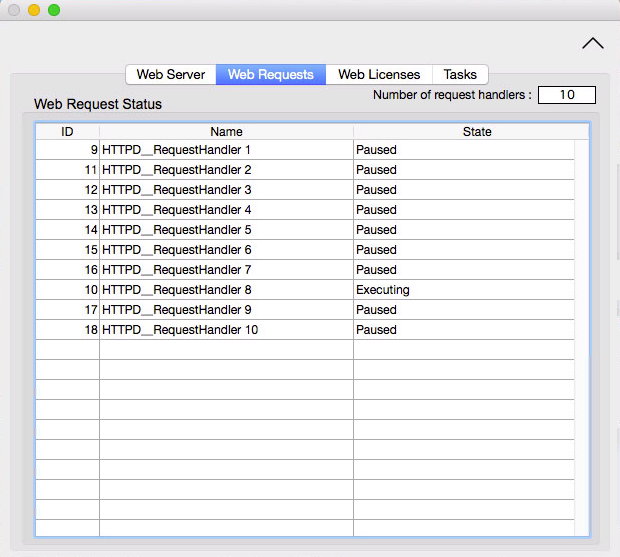 The Web Requests tab provides a snapshot of current activity on your server....it's not terribly exciting. 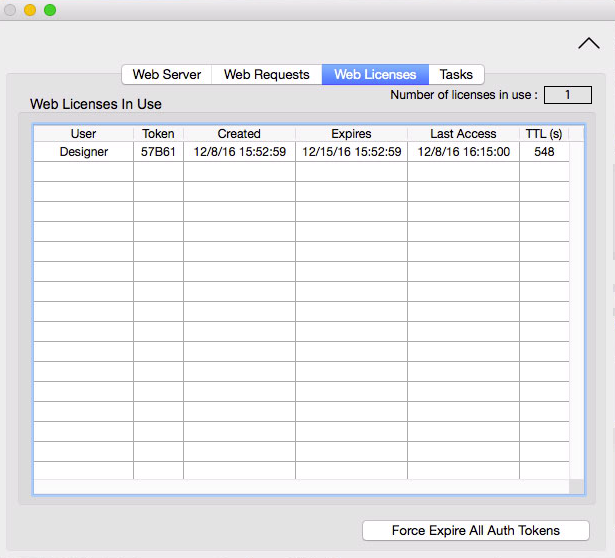 The Web Licenses tab indicates which users are currently logged in via a web enabled device and when their 'token' is set to expire. The token is a unique key that is issued by the server when a user logs in. The token will refresh continuously while the user is active in the system. After a certain amount of time (TTL) without activity, the token will expire and the user will be prompted to re-enter a password to continue. In the example below, Designer has 548 seconds to do something before being logged out. The Force Expire button will cause all current tokens to be disabled and force all users to log in again. The Tasks tab is not part of the web server function; this is a general listing of Background Tasks being performed by AcctVantage Server for the local network clients.